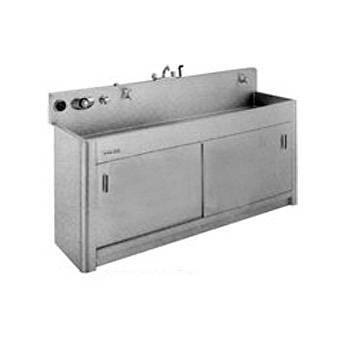 Arkay Stainless Steel Cabinets are made using 18-gauge type 316 LC stainless steel. The corners on these cabinets match the sinks with their 1-1/2" radius rounded and polished outside corners. The cabinets feature convenient storage shelves and sliding doors, and can be modified to meet ADA wheelchair access requirements.